How to show your love your bestie! Keep calm and dress alike with your bestie! "I have a bestfriend and she always get lost while shoppping. So I bought a sister outfit for her so that I could found her easily. " - Elaine, 24. We guess that every girl has one of those besties that everybody all had seen her or heard about. Every girl would like to show off her bestie to the world and telling the world how nice, how beautiful she is. You treat her like a treasure and is reciprocated. And you fantasize about wearing the outfit with your bestie so that people would know it directly know that you guys are BFF. There are tons of ways to style the sister-wear look, put aside the old-fashioned mindset of "wearing the exact same shirt" and try other kinds of sister wear outfits. This is the easiest way to style the "same shirt" outfit idea. All you need is just to drag your bestie to a boutique and find any style of clothes that both of you like in two different colors. It is as easy as ABC yet more fashionable than the plain-old t-shirt matching. If you are lazy to go out or perhaps your bestie are way too busy to go and buy with you together, why not just online shopping? You can look at >>> GLUR for more choices! All of the outfits are pretty nice and we bet that your bestie would love it too! This is also one of the ways to mix and match bestie outfit. However, it is slightly challenging compare to the first option. You need to find a style that is different but not to the extent where people are unable to pick up the resemblance. So, how to choose? You can try to find another piece of outfit that has slightly different pattern on the shirt etc. The typical example is a crop tee + A-line shirt, or another outfit perhaps can be an oversized tee + tennis skirt). You can scroll through the photos below to get more inspiration on how to mix and match on this kind of bestie outfit. We do have some of these bestie outfits on Fasheholic from one of our most popular brands. You can check out this link >>>> dear.nifty to find out more! If you are fond of pastel color, then you should really look into it! For those BFF that have totally opposing fashion sense, we suggest the classic Black and White combination - one of the styles that can never do you wrong. If you find the outfits attractive and feel like add to your wardrobe, congratulation! Your wish can be granted by checking out >>>> Evalynbrand. All of the dress and tops are well-designed and absolutely "GORGEOUS". Perhaps you and your bestie are not a fan of the 'pretty, gorgeous, feminine' style and more towards 'swag', then both of you should try this. It is very easy to pull off this style only by remembering the - 'black & white' + 'oversized technique'. If you think there still lacking something and can't really feel the swag of it, you could probably wear a cap. Yes, it is an essential accessory that could potentially accentuate the style. As John Wooden always says "It's the little details that are vital." We hope we you inspired you to have enough ideas on how to mix and match the bestie outfit? Go on to the grab your bestie outfits now on Fasheholic! 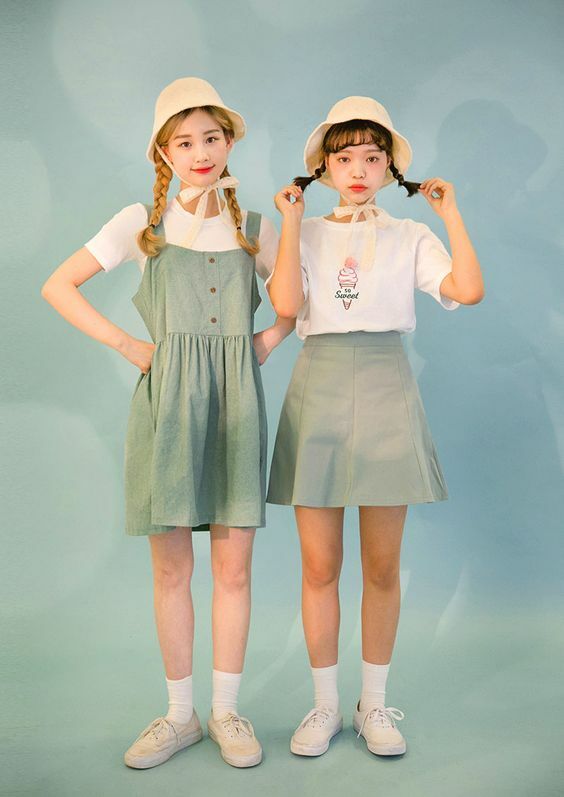 Trending Korean Ulzzang Street Fashion tips that you shouldn't miss. Easy tips to show you how to be an Ulzzang. 4 One Piece Dress Fashion that'll have you ready in under 30 minutes! Save time, save money and be stylish.